Get the most out of Swift 4 with this carefully compiled collection of select code snippets designed to solve everyday coding problems. This book features the Apress easy-to-use recipe format, with step-by-step instructions, and a no-fuss approach. You'll explore a wide range of topics, all neatly organized according to the language's own core elements and building blocks. You'll review common topics such as conditionals, loops, functions, classes, closures, and arrays. This book also includes recipes to some more advanced problems found in files, system programming, and algorithms. 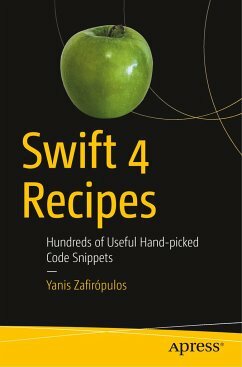 With Swift 4 Recipes , your programming problems are easily resolved, without wading through paragraphs of text. What You'll Learn Create if-switch statements, ternary operator, and nil-coalescing Work with numbers, conversions, mathematical functions Access the command line and retrieving system info Who This Book Is For Mac and iOS developers either looking for a quick problem-solution manual to get started or in search of a quick reference for everyday problems in a dictionary-like fashion. Ioannis Zafeiropoulosis a 32-year-old developer from Greece, living in the south of Spain. Before becoming a programmer, he studied medicine. But his lifelong passion for programming beginning when he was 7-year-olds has led to him writing code in practically every programming languages. He's even created his own langauge. 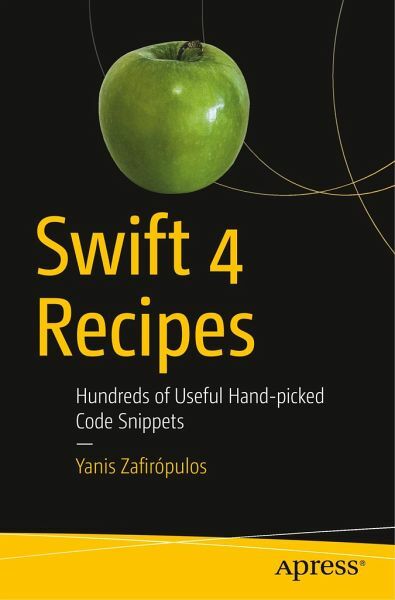 Swift Recipes has been his own day-to-day companion, whenever he's need to find a solution to some Swift programming problem, or simply cannot remember one. Chapter 13: More Advanced Topics.